The combination of increased slaughter capacity and lower-than-expected hog numbers has been positive for hog prices this fall. Over the 11 weeks since Labor Day, hog slaughter has been up 2.1%, year-over-year. 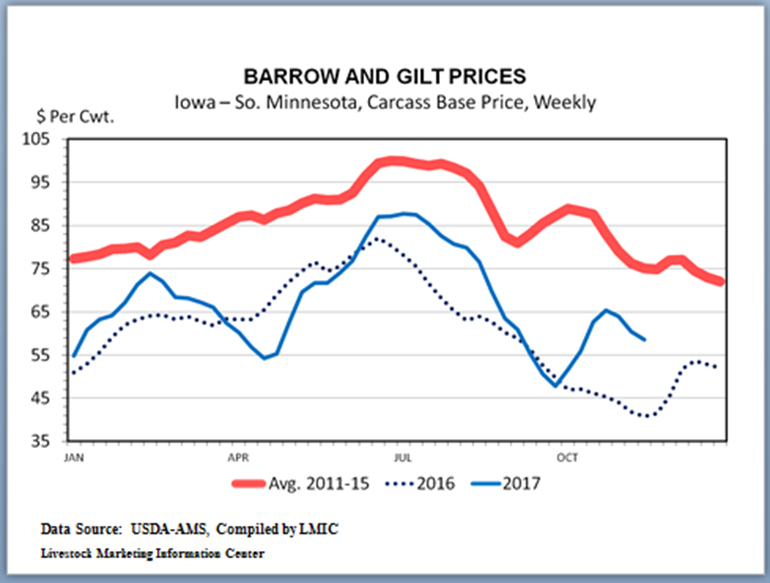 Imports of slaughter hogs from Canada are down, so U.S.-raised barrow and gilt slaughter has been up a fraction more at 2.2%. That is less than expected. The 120-pound-plus market hog inventory in the September Hogs and Pigs Report indicated slaughter of U.S.-raised market hogs during this period would be up 3.9%. The light weight market hog inventory in the September Hogs and Pigs Report indicates weekly market hog slaughter will be up 1.7% to 1.8% year-over-year for the next 15 weeks or a bit less if live hog imports from Canada remain low. Two older plants in Minnesota and Missouri were remodeled and reopened earlier this year. The big, new hog slaughter plants in Sioux City, Iowa, and Coldwater, Mich., both began operations on Sept. 5. Prior to this fall, the record daily slaughter was 448,608 hogs processed on Dec. 12, 2016. Daily slaughter exceeded 450,000 head for the first time in August and exceeded 460,000 for the first time in September. Hog slaughter fell 138 head short of 465,000 on Oct. 10. Daily slaughter will likely set more records before the end of the year as these plants continue to increase their chain speed. The combination of increased slaughter capacity and lower-than-expected hog numbers has been positive for hog prices this fall. The added slaughter capacity has allowed packers to handle more of the weekly kill by Friday leaving fewer hogs for Saturday slaughter. During the 11 weeks since Labor Day, Monday-Friday slaughter has been up 5.7% and Saturday slaughter has been down 25% compared to a year ago. Put another way, during this 11-week period last year 11.9% of hog slaughter occurred on Saturday. During the same 11 weeks this year, only 8.8% of slaughter occurred on Saturday. Last Saturday’s hog slaughter was 154,000 head, down 19.4% from the week before and down 53.2% year-over-year. Packers only operate six days per week when there are lots of hogs available and their margins are strong. As a general rule, the larger Saturday slaughter, the greater packer margins, i.e. the wider the spread between cutout value and hog price. Packer margins are usually the greatest in the fall when the hog run is so large as to necessitate a large Saturday kill. Since this fall packers are better able to handle the hog run without having to operate large Saturday kills, packer margins have tightened and hog producers are getting the benefit. In the 11 weeks following Labor Day 2016, the negotiated Iowa-Minnesota market hog price averaged $47.99 per hundredweight. During the same period this year, the Iowa-Minnesota price averaged nearly $10 higher at $57.42 per hundredweight. This fall’s hog prices are higher despite increased slaughter. Part of the hog price increase is due to higher cutout values. In the first 11 weeks following Labor Day 2016, the pork cutout value averaged $75.37 per hundredweight. During the same period this year the cutout averaged nearly $1.84 higher at $77.21 per hundredweight. Most of this fall’s hog price increase is due to tighter packer margins. The post Labor Day Iowa-Minnesota negotiated market hog price averaged 63.7% of cutout value last fall and 74.4% this fall. Weights have been running high this fall. During the past 11 weeks U.S. hog slaughter was up 2.1% and pork production up 2.4%, thus weights were up 0.3%. Barrow and gilt carcass weights averaged 209.94 pounds in the prior day slaughter data for the 11 weeks starting after Labor Day 2016. The same period this year carcass weights averaged 211.0 pounds. 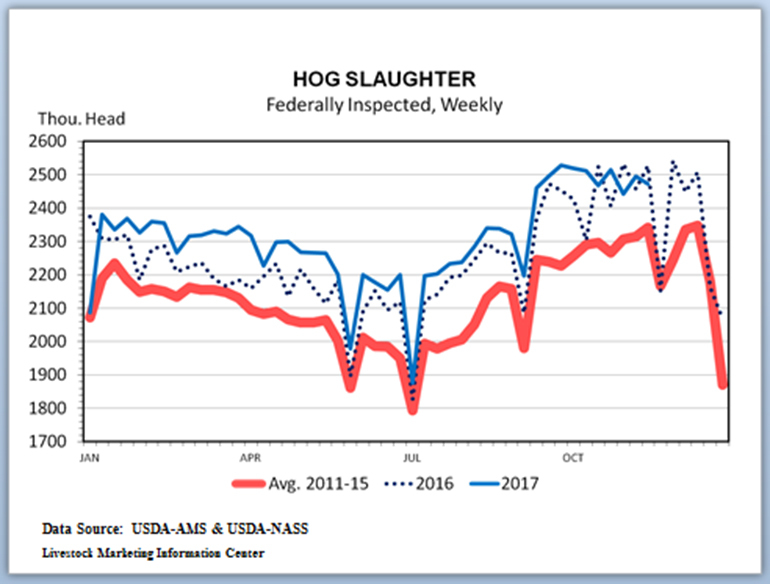 The final six weeks of 2016 saw federally inspected hog slaughter of 13.8754 million head with a cutout value of $76.78 per hundredweight and an Iowa-Minnesota average negotiated market hog price of $49.67 per hundredweight, which equaled 64.7% of cutout value. If the September Hogs and Pigs Report is right, hog slaughter will be up 1.8% for the final six weeks of 2017. If weights continue their trend, then pork production will be up 2.1% or so compared to a year earlier. Forecasting prices is always risky, but if pork demand continues strong and if the year-over-year relationships continue, the rest of 2017 should yield a pork cutout that is in the neighborhood of $80 per hundredweight and an Iowa-Minnesota negotiated purchase price that is around $60 per hundredweight. The USDA will release both the Livestock Slaughter report and the Cold Storage report for October on Nov. 22. 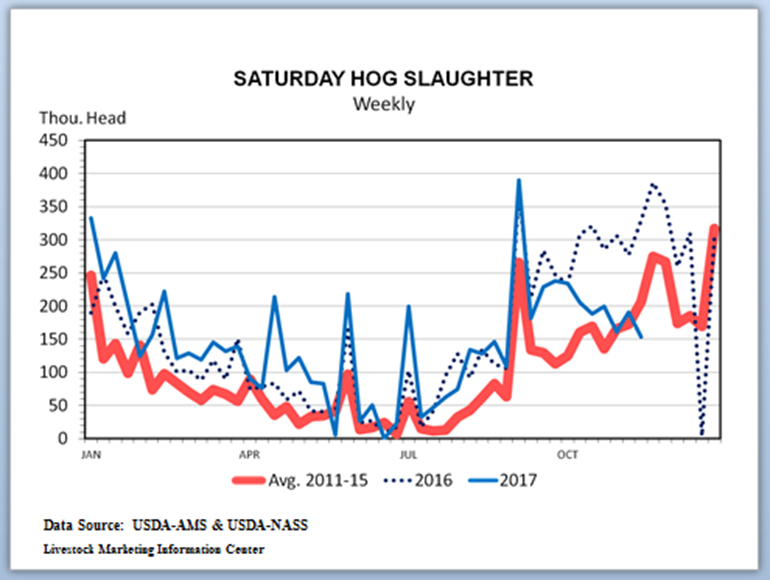 Based on preliminary data, it looks like October hog slaughter was up 5.3% from a year earlier, due largely to one additional slaughter day than in October 2016. The amount of pork in cold storage has been below the year-ago level each month since January 2016. I won’t be surprised if this streak continues for another month.